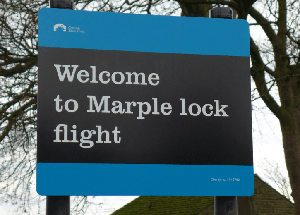 IT WAS in July of last year that the Marple Flight on the Peak Forest Canal was closed, but there is little chance of it being re-opened as promised. It was closed owing to the walls of Lock 11 moving inwards with its re-opening promised for the start of this year's boating season, but that is not to be, Keith Gudgin tells. The new re-opening date that is given by Canal & River Trust is now the end of May, meaning it will have taken all of nine months to repair. Delays have been encountered in the piling phase of the works, with the augering of the ground and reinforced concrete pile installation behind the existing lock walls proving slower than expected, as well as having to address some design changes due to site constraints. However, the piling is now complete, ensuring the ground is stable so that the failed lock walls can be carefully dismantled. So seven months have elapsed and not only have they not started building the lock walls but have not yet even dismantled the damaged ones!